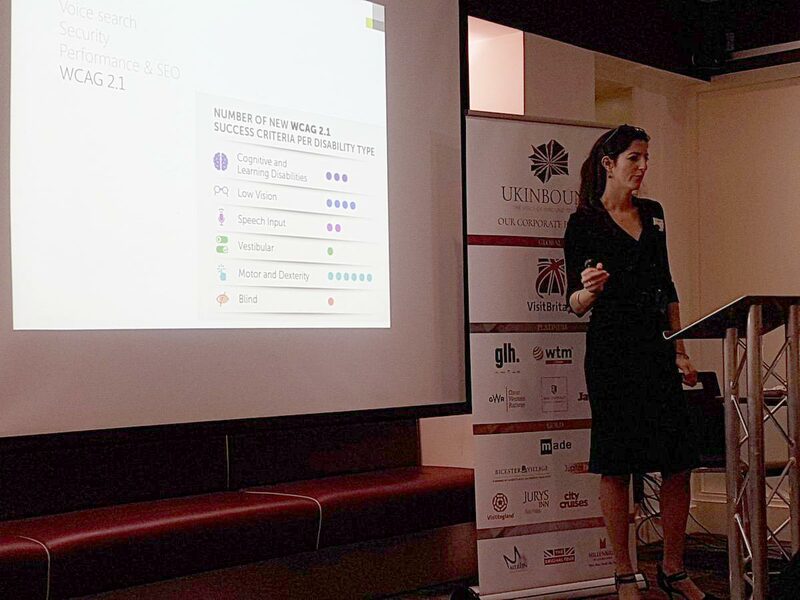 As a result of delivering a successful new website and CRM integration project for UKinbound, which achieved the objectives and continues to improve user engagement, we were delighted to be invited to deliver a presentation at their member event titled “Your website – best practice and future trends”. Established in 1977 and now with nearly 400 members, UKinbound is the only trade association that represents the interests of the UK’s inbound tourism sector to ensure it is recognised as a leading economic and employment driver in the UK. Alongside a programme of events they also lobby Government on key industry issues, and engage with the media to raise the profile of tourism and highlight its importance to the economy. Christian, who led the delivery of the new website said “it was a great project with many complex challenges to overcome especially with the CRM integration, but weekly meetings and clear communication helped to build a really good relationship, and are delighted with the results. Our Head of Business Development, Katie delivered the presentation, saying “it was fun to deliver our presentation and to witness the different responses from the audience especially when talking about contentious issues like the pros and cons of using carousels / image sliders, which we still find on the homepage of the majority of sites but are actually, and always have been, really bad practice”. The presentation swiftly covered some dying trends like parallax scroll and lots of accessibility faux pas, before briefly touching on todays hottest topics being voice, AI and performance. We then took a more in-depth look at the latest trends of typography, rich gradients and colours, micro movement and animation. Katie was joined at the seminar by Katarina Kljajic from Crimtan, who spoke about delivering relevant and engaging ads using dynamic creative, and how lawful use of personal data can help you achieve this. Katie King from AI in Marketing talked about how artificial intelligence is already integrated in more everyday technologies than we think, for example, social photo facial recognition, speech recognition, chatbots and more, and that by 2020 more new jobs will be created as a result of AI than will be eliminated. Some top tips were delivered by TripAdvisors Justin Reid including how to claim your listing, the benefits of using photos that are a positive reflection of your business, and the importance of responding to comments (good and bad) on any review platform. The seminar was attended by nearly 50 tourism experts who enjoyed all of the speakers presentations and took away lots of ideas to improve their digital marketing. Get in touch if you would like to evolve your website to embrace the latest trends.